Believe itor not, we are almost three quarters into 2017! This isthe point where many businesses have begun reviewing their influencer marketingplans and are gearing up for the next calendar year. Let’s take a look atthe crystal ball and find out where influencer marketing is heading to in 2018. Influencerscan be classified into 3 main categories: mega-Influencers, macro-Influencersand micro-Influencers. If 2017 isthe year of Micro-Influencers, then 2018 is going to be a year of integration. There will bea growing demand to formulate integrated influencer marketing strategies whichwill weave together mega-Influencers, macro-Influencers and micro-influencers as well as merge other well-established word-of-mouthstrategies such as Loyalty, Advocacy and Referral Programmes. All of which willresult in an integrated customer experience strategy. Influencermarketing aims to build an experience and emotional connection between a brandand their target customers. This means building relevant content touch-pointsalong the entire customer journey. Dependingon where on the journey a marketer may be focusing their efforts, different influencers,content channels and strategies can be employed. In orderto generate awareness in the social media space, brands can work closely withmacro-influencers and micro-influencers who are relevant to their business. At this stage,influencers create inspirational content through storytelling to introduce newproducts and feature capabilities to followers. This will instantlyelevates brand’s image and fosters strong brand affinity among their fans. At thisstage, Influencers answer common questions about the product and services.Often times, it means taking the prospects through a series of interactions byproviding interesting, educational and valuable content. However, creating goodcontent is difficult. Determining the type of content that is appropriate forthe business and taking into the consideration the unique proposition of eachinfluencer the brands are working with isn’t easy either. With heightenedinterests, businesses can start planning offers or promotions exclusively forthe influencers’ followers or subscribers on social media. This is when brandscan demonstrate that what they are selling will satisfy desired needs throughreviews or testimonials etc. The right offer (with the right price), with proofconfirming the quality of the product or service, will enhance their desire topurchase. At thisstage, influencers direct customers to the correct paths and channels tocomplete their purchase or further evaluate options (measured in downloads,trials, demonstrations, inquiries, purchases, etc.) After the prospectstransform into paying clients, it will prove the brand has used its socialmedia channels successfully. One of the returns of investment (ROI) of socialmedia marketing is converting leads into sales. But it is relativelychallenging to measure how many people convert to customers throughinfluencers. One of the most common method is to use ‘promo-codes’ and trackthe conversion brought about by each influencer. Besidesplacing emphasis on Awareness, Interest, Desire, and Action, delighting acustomer through the whole customer journey is the underlying factor which willturn a customer into a brand advocate. By leveraging on social media,this sales process can be extended to the point of turning the customer into anadvocate for your product. When customers engage actively and spread the word,they become great ambassadors who can continue the brand’s sales cycleautomatically. Theword-of-mouth that advocates spread is powerful. The more advocates one hasdeveloped; the sooner one can reduce the cost-per-user acquisition throughinfluencer marketing. 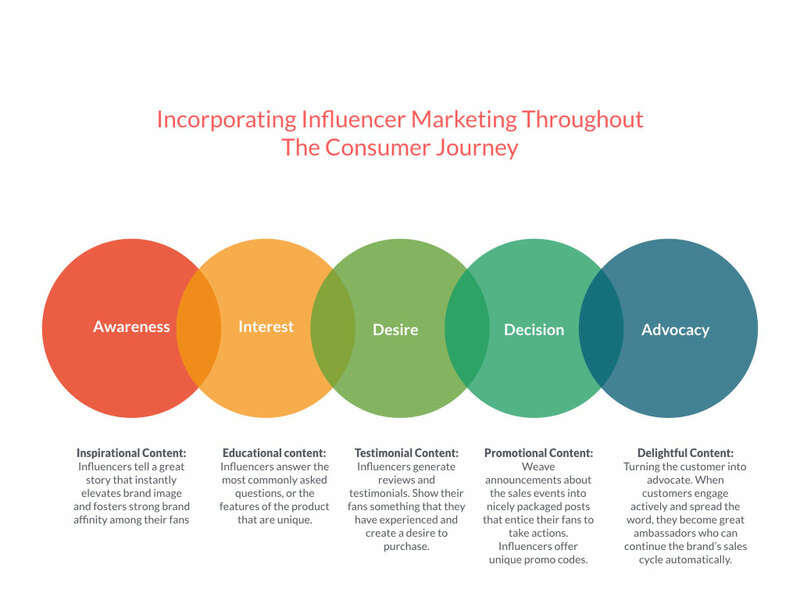 By andlarge, influencer marketing has largely been leveraged on as a campaign tactic.To take influencer marketing from tactical to strategy level, it requires acomprehensive, always-on program built on an intrinsic, self-sustainingfoundation of authentic brand-influencer relationships that consistentlydeliver value for both sides. Customerjourneys are ‘always on,’ while campaigns come and go. To fast track digital transformation,marketing strategists must learn more about how customers make decisions, whoand what influences them, and why. Influencer relations, spanning fromrelationship building and nurturing, to the platforms that enable accurateidentification and influencer management, help in fostering the relationshipwith influencers. Engaginginfluencers that have already captured the attention of a target audienceshould also be an always-on strategy. Maintaining the relationship is complexand requires dynamic, personalised messaging based on who the influencer is,their preferences, and motivations. Makeinfluencer relations a priority now. If you continue to approach influencermarketing as usual, you are prepping to be left behind, losing control of yourbrand and the ability to compete in a world where customers are in control. Discover– Find influencers based onuser criteria including all the engagement metrics, audience demographic andtopics of influence. It is about finding the right fit between an influencerand a brand. A good fit between an influencer and brand is one wherea mission, visions, messaging and identities align. Connect– Communicate with influencersvia the platform to discuss the engagement. Main feature focus on communitymanagement and direct messaging. Engage(unpaid) – Engage influencer foran unpaid activity like writing a blog post and an Instagram post. This isquite common for product sampling. Recruit(paid) – Engage influencerfor a paid activity like speaking at an event or creating content, usually onsponsored content or pay per content creation model. Review – Allow the advertising to review the content prior topromotion. This depends on whether a brand takes a hands-on or hands-off approachwith their creative direction. Measure– Advanced metrics andanalytics for performance management to track the visitors, page views, clickthrough rate and conversion rate. Analytics like these allow brands tounderstand the results of the influencers’ post, whether it be engagement, webtraffic, earned media value or ROI. Socialmedia influencers arethe new generation celebrities who have built incredible personal brands onlineand more and more influencers are trying to expand that influence into theirown businesses. For mostinfluencers, getting started is difficult, as most of them don’t have theresources and expertise to build and manage their own multi-channel stores.E-commerce platforms like Amazon and Shopify are offering new services to helpthese influencers grow and scale in e-commerce. AmazonSpark – Amazon Spark is like anInstagram feed and quite a number of influencers are already using the featureto post photos and highlight products from sponsoring brands. ShopifyVIP – Shopify VIP providesinfrastructure and customer management support for e-commerce. Influencers willbe able to launch their own multi-channel store, receive guidance from adedicated personal concierge, and have access to applications, like embeddablebuy buttons, which allow them to sell and cross-promote their own brands acrossvarious digital channels. 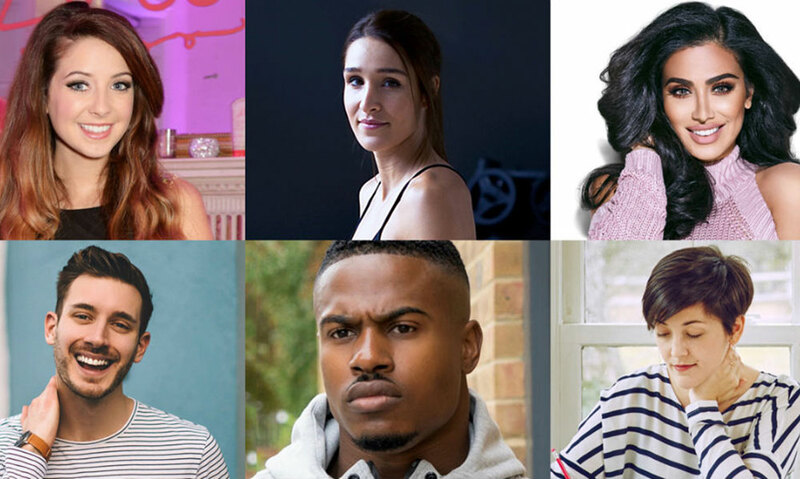 You cansee that social media influencers are using e-commerce to turn their onlinefame into an online business, for example, @Zoella, @Michelle Phan, @HudaKattan, @Emily Skype and @Michelle Lewin. In China,social media influencers are better known as Wang Hong and Key Opinion Leaders(KOL). These top Wang Hong such as @Cherie, @BeautifulSummer, @Zowzow and@ZhangDaYi brought in millions of dollars in sales during the Taobao &TMall Online Shopping Festival 11.11. Influencemarketing isn’t new in B2B. In tandem with the trend set forth by their B2Cbrethren, B2B marketers will continue partnering with influencers but willfocus more on B2B social channels like LinkedIn, Facebook, Twitter and YouTube,etc. Similar to B2C segment, the rise of micro-influencers in the B2B space andavailability of more solutions to identify key B2B influencers such as Buzzsumowill help to propel the growth in B2B influencer marketing. This casestudy onEntrepreneur highlights just some examples of the undeniable importance thatB2B influencer marketing has. From blog and social media content to creatingvaluable video content for your consumers, if you can publish them on relevantinfluential websites, you’ll be able to generate quality leads andsignificantly boost your website traffic. Most B2Binfluencers have built their industry status on work related credibility andtheir independent voice. Expecting B2B influencers to ‘sell’ immediately is ashort-sighted strategy. The long term strategy is to build the relationship.Instead of asking for an explicit promotion or sales campaign, work with B2Binfluencers whose goals and ethos align with your business. To beginwith, you can focus on small groups of B2B influencers and build deeperrelationships with them so that you will get to know them and the influencersget to know you and your products more intimately. This isjust the beginning and influencer marketing will only continue to grow at thefastest speed in 2018. So youbetter start planning a strategy and start building your influencer network! What areyou seeing as the biggest trends for influencer marketing next year? Do you seethe same social media marketing trends moving forward?